This free eBook shows importers who are new to outsourcing production to China or Vietnam the key foundations of a proven Quality Assurance strategy, and also lifts the lid on common pitfalls and how to overcome them in order to get the best possible production results. Sofeast's expert Quality Assurance team, led by CEO Renaud Anjoran (who is also the author of QualityInspection.org), created this eBook for importers who need help when outsourcing production to Chinese or Vietnamese suppliers to allow you to tap into our decades of QA experience in Asia. Potential pitfalls commonly encountered at each stage of a sourcing project and how to overcome them so you don’t fall into the same trap! 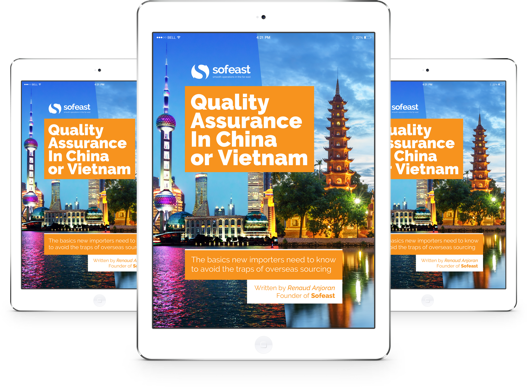 Get your FREE copy of this eBook and learn how to implement better quality assurance in China & Vietnam. After reading this eBook you'll know what an effective quality assurance strategy looks like for importers with Chinese and Vietnamese suppliers and have the knowledge to avoid common overseas sourcing traps and mistakes which all add up to negatively affect your quality, bottom-line, and delivery. Share this eBook with your networks.